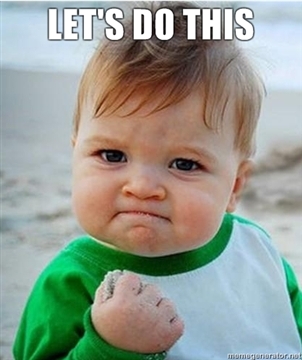 I’m running my first postpartum long-distance race on Saturday – the Hot Chocolate 15K in Minneapolis. I haven’t talked about my training on the blog much, because well, there hasn’t been a ton to talk about. Pre-baby, I did 95% of the workouts on my training plan. Post-baby, I’ve done maybe 60%. Which may or may not turn out to be a really bad idea. My weekly long run was the one I did consistently – I only missed one, and that was the weekend we were moving. I ended up adjusting the remaining long runs slightly, to account for that (so that my distance didn’t jump up too much in one week). 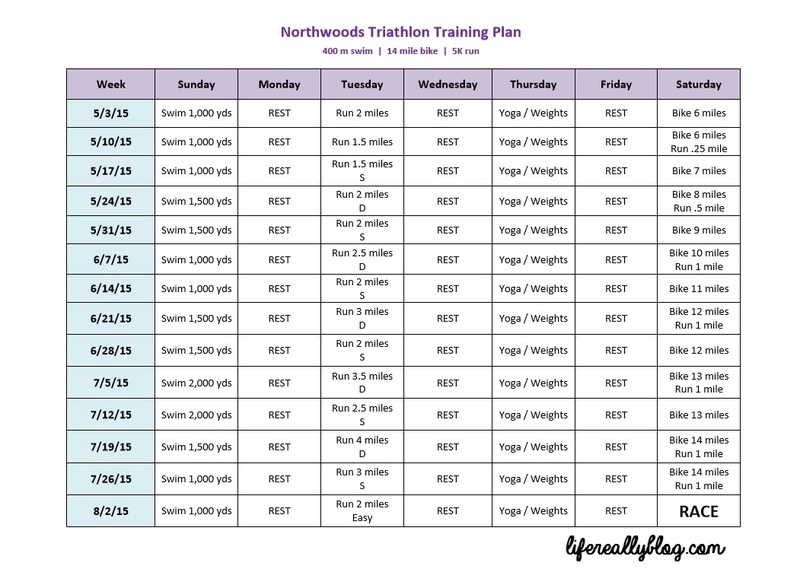 The training plan I’m following (Hal Higdon’s Novice 15K) had my longest run before the race being 8 miles, and I felt comfortable doing only 7.5. I know my way around Nevis enough to be confident that I wouldn’t get lost (and the town isn’t that big) so I parked at the Catholic church and took off running. I decided to not look at my Garmin until my playlist ended (around 30 minutes). At that point, I had covered 2.7 miles. 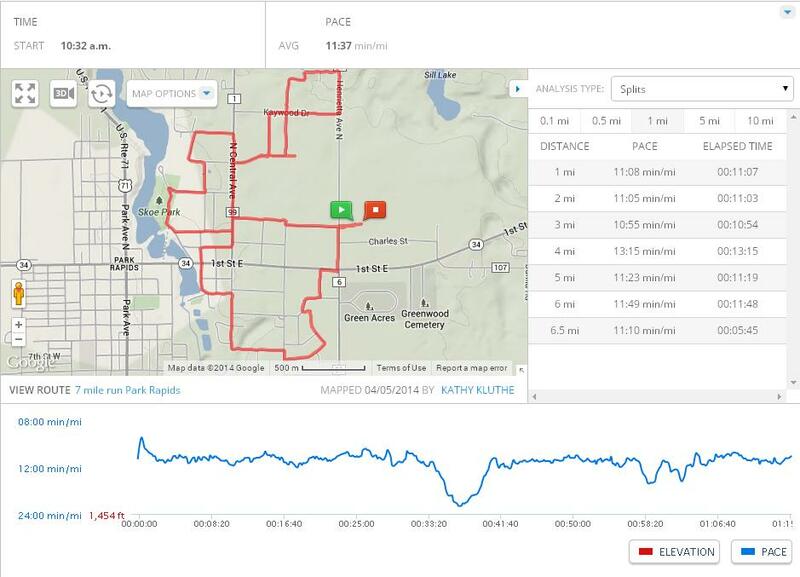 So I did a few more loops, aiming to hit at least 5.5 miles – and well, 5 miles would be fine too. Well, I underestimated how long the loop would be so I ended up doing a full 6 miles. That elevation map looks crazy but if you look at the elevation, it’s only varying 50 ft. Ha. I pretty much saw all there was to see (some of it twice!) in Nevis, so for this long run, I headed to the neighboring town of Park Rapids and ran while my mother-in-law got her hair done. 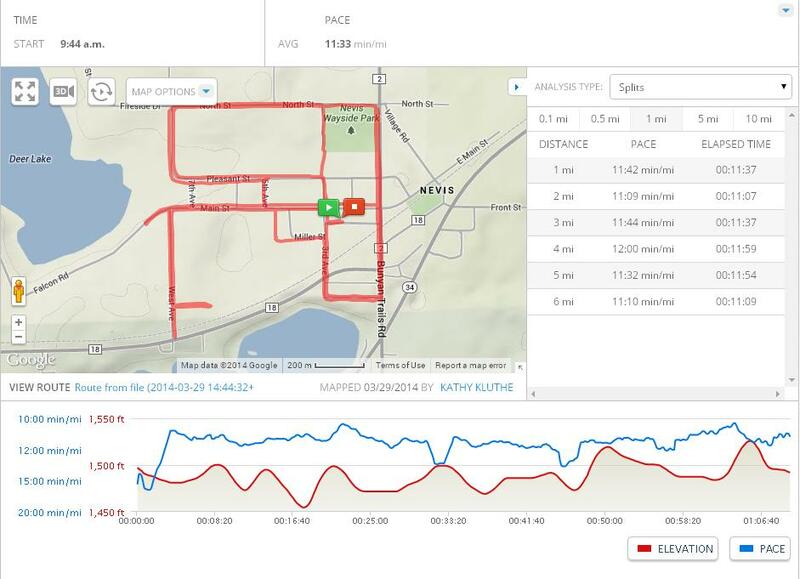 This was the first time I had mapped out a route on MapMyRun ahead of time, and then looked it up on my phone to follow it. It actually worked really well, and I would do it again, though I do recommend not making your route such a crazy loop! I didn’t get to enjoy my surroundings as much with this run, since I was constantly looking at my phone trying to figure out where I needed to turn. I also ended up getting a stomachache toward the end, so I cut my run short by 1/2 mile. 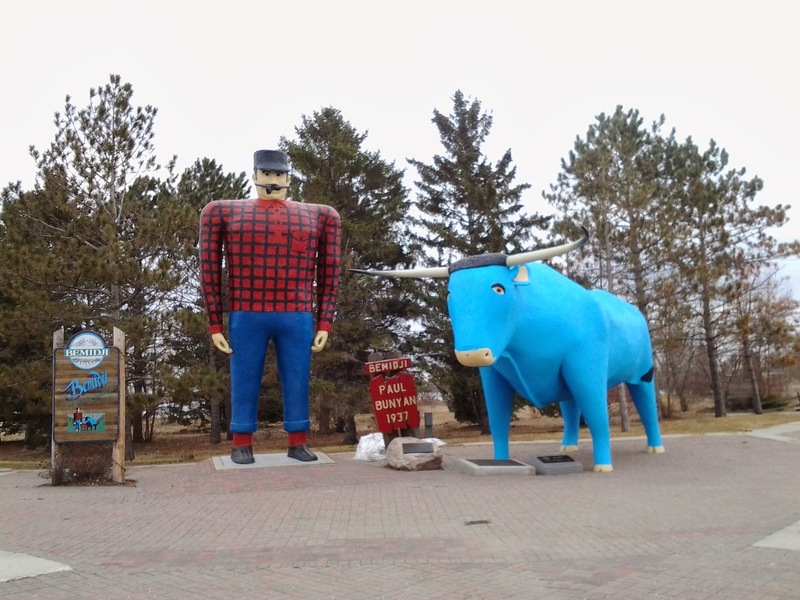 It was nasty outside this day – 30 degrees, cloudy and windy with gusts up to 25 mph. I was not in a mood to go running, especially in the wind, but it was my LAST long run before the race so I couldn’t wimp out! I drove up to Bemidji where my sister-in-law lives, so she could watch Emma while I ran – a win-win! (Travis is still studying for the California PE test, which is this coming Monday! Soooo ready for that to be done with.) I had Carolyn drive me 7.5 miles from her house, so that I could run with the wind, instead of against it. I’ve done this before and it’s a great way to get your run in even when the weather is crappy. And hey, the wind helped my pace – I ran the second mile in 10:12!! This last run really boosted my confidence level. Up until then, my runs had felt lethargic and slow. Like my legs just wouldn’t wake up. But this run, I felt light, fast and excited about running. The last 2 miles were tough because they were around the south side of the lake where the wind was strong, there was snow on the trail and my legs were getting tired, but I finished the whole thing! Overall, I’ve enjoyed training for this race, but it’ll be my last for a while. I honestly only have the motivation/energy for working out about 3 times a week right now, and when I’m training for a race, I feel like the only thing I should spend my workouts doing is running – which leads to burnout and injury. I also did not dedicate enough time to the things that are necessary training components outside of running, like stretching, getting enough sleep, fueling correctly, drinking enough water, etc. Part of that, though, is being in the middle of moving. For a while, I wasn’t sure where my foam roller was – once I found that, I started using it fairly regularly. All of my running fuel is packed up, so I haven’t been fueling during my runs at all (and really, I don’t feel like 7.5 miles really requires that – but I will fuel during the race because I could’ve used a little pick-me-up during my last run!). I also think that I should’ve done more strength training and cross training in building up to this race – if not during the training plan, at least before beginning training. I think my muscles atrophied a lot during pregnancy and as all runners know, it’s possible to develop the muscles you need for running by running – but you usually end up being out of balance and more easily injured. My knee joints have been the thing bothering me the most, and I’m sure tight IT bands are somewhat to blame (it has gotten better since I got my foam roller out). But I also think that if my legs were stronger from non-running activities, and limber from more yoga, my knees would be happier. So after this race, I’m looking forward to doing more yoga, walking and maybe a few exercise videos. I’ll probably still run once a week just to keep my fitness up, but I need some variety back! 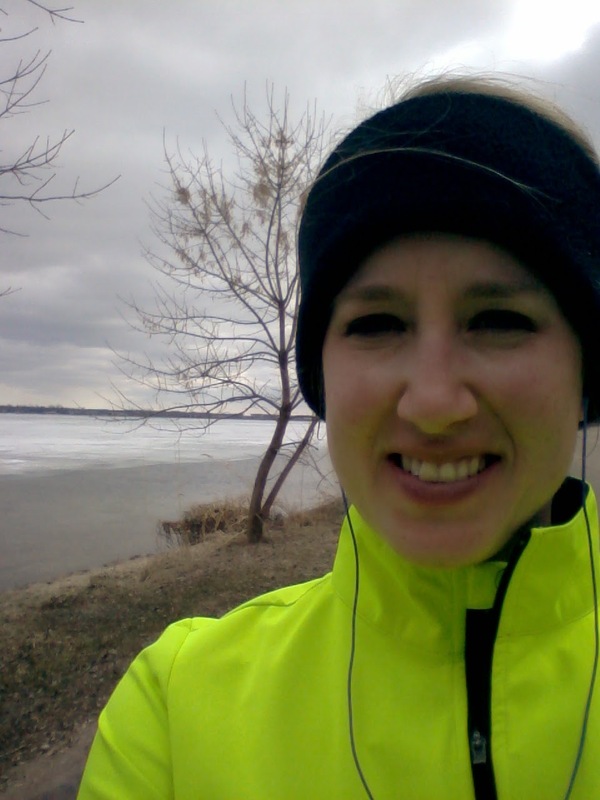 I am doing this training recap early because this morning, I went on my last training run! My runs this week were just like last week’s – slow, recovery pace. My massage Monday seems to have helped my tight muscles ever so slightly but they’re still begging for lots and lots of stretching. Anyway… here’s what has happened so far this week. On today’s run, the first 3 miles I ran were around a 12:50 pace. Then the last mile, I ran in 10:59, just to remind myself that I can run faster. Saturday: Mayor’s Marathon – 26.2 miles! 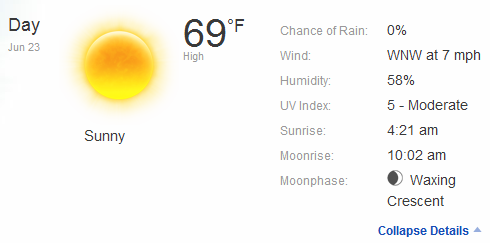 Apparently, 69* is hot for Anchorage. But for Denver, it’s downright chilly (what with all the upper 90s we’ve been having lately. I’m not complaining though – dry heat is nothing like humid heat!) And I love that sunrise in Anchorage is at 4:21 – no getting up when it’s still dark outside for this race! The race starts at 8:00 so I figure I could get up around 5:30 or 6:00, get to the race site around 7:00 and be good to go. I got in all of my planned miles last week and each run felt better than the last. I purposefully ran them all at a very slow recovery pace. Even when I felt like I could run faster, I made myself keep it slow and VERY easy, reminding myself, “Running slow is the thing helping your legs feel better.” Having no pace pressure also made running more enjoyable! And with that, it is now RACE WEEK! Gah! My IT band/hamstring/glute/hip area has been feeling really tight the past week so I got a massage last night. It felt great, though there were definitely some areas that had me wincing a bit while the lady worked them over. My legs felt great on my run this morning but they end up getting angry the longer I sit down at work. Even though I get up to stretch and walk around every hour, my hips are not happy! At least they don’t hurt while I’m running. Travis and I still have a lot of stuff to do before we leave on Friday morning so I gotta go. It’s good that I’m busy – less time to drive myself crazy with race day nerves! As I’m almost staring down a week until the marathon, I’ve started getting my race strategy together. 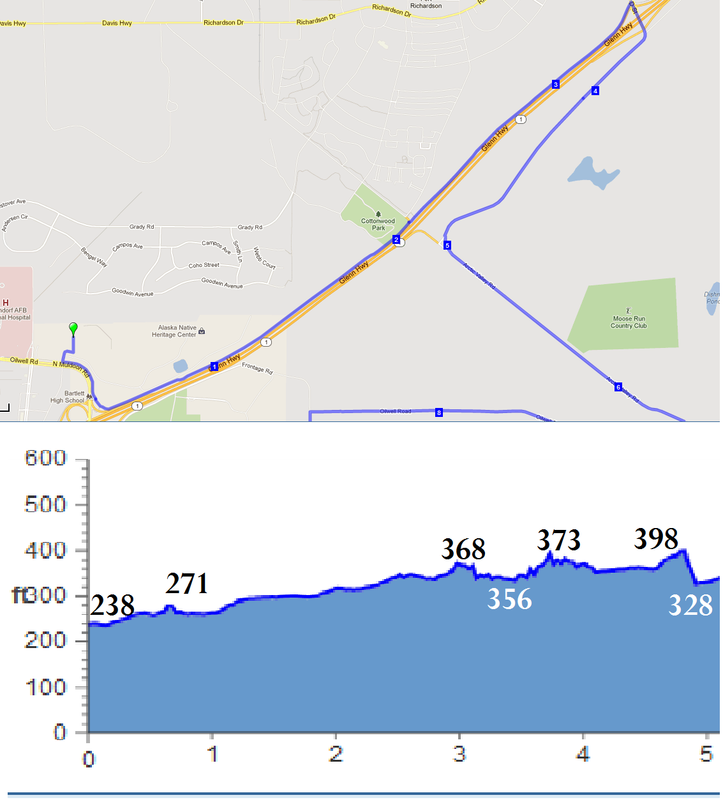 Using the published course map and the satellite view in runningahead.com, I mapped the marathon course. It helps me in races to recognize the portion of the course I’m on so that I have an idea of where I am and where I’m going. 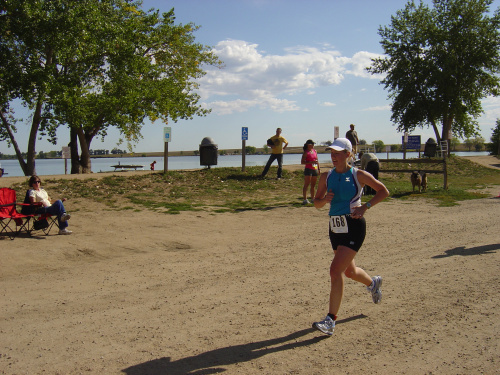 For this race, it will also help me prepare for the hills – and get ready to cruise the downhills! 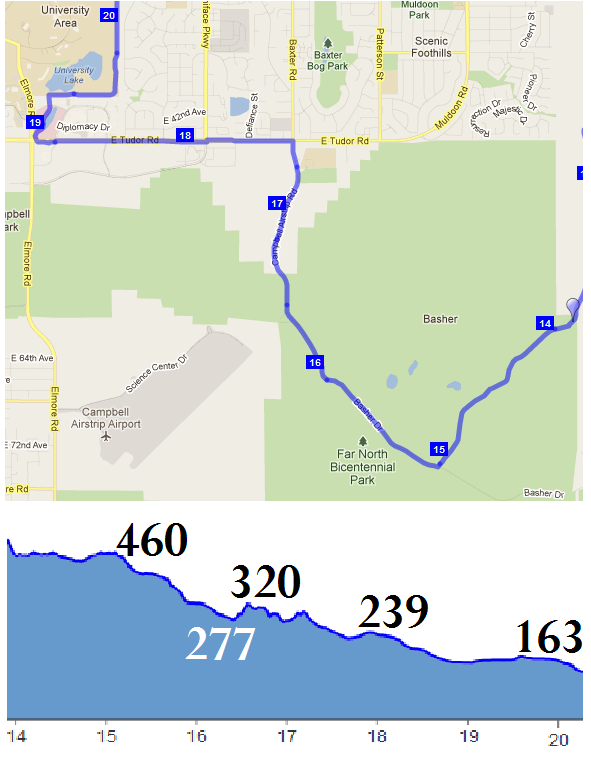 Miles 1-5 are an out and back along the highway following a paved trail or road. 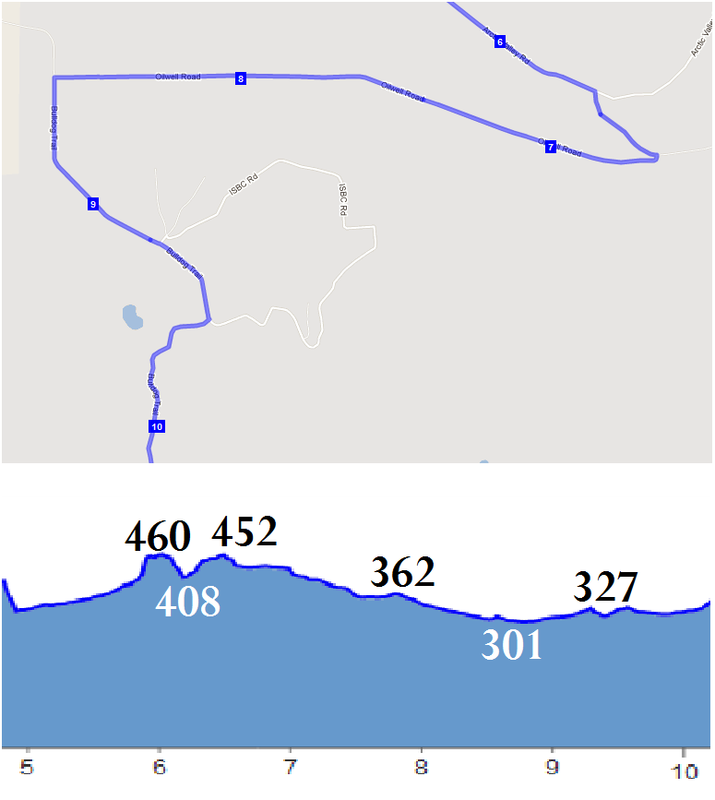 The elevation gain is steady – 150 feet in 5 miles. 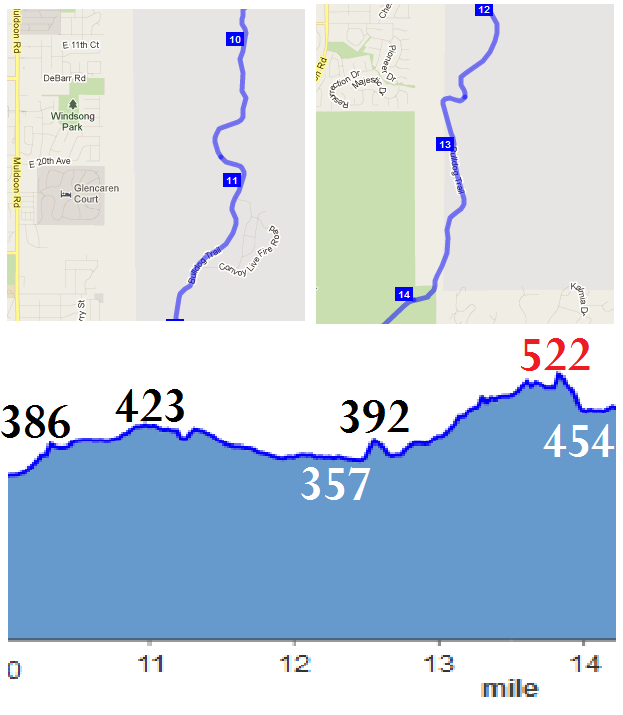 Since I’m used to this kind of elevation gain from my daily runs, I’m not worried about the hills. I will, however, be keeping a close eye on my watch to make sure I don’t go out too fast. Coming from elevation to sea level, it could be hard to accurately gauge how fast I’m running when I start. My goal is to run these miles at a very conservative, relaxed pace, probably somewhere around 11:45/mile. If I see my pace go faster than 11:30, I will slow myself down. Miles 6-10 are a nice little downhill! But they also include 4 miles out of 7 that we run on a gravel road called the Oilwell Tank Trail. So these miles will be spent focusing on not twisting my ankle and watching out for wildlife like moose and bears! I read that the race organizers and wildlife rangers sweep the trail in the morning to make sure there aren’t any hanging around but that doesn’t mean they could mosey on over there before I get to that spot. Miles 11-14 are still on the Oilwell Tank Trail and are the last section of extended uphill! I will allow myself to walk if needed here and just focus on getting to mile 15 without killing my legs. Miles 15-20 are a net downhill of 300 feet! This is where I’ll pick up steam if I’m feeling good. But I won’t let myself run faster than 11 minute miles because I’ll still have that last 10K to run! The few short pesky hills in this stretch should help keep my pace moderate. Mile 15 is also the last of the Oilwell Tank Trail – I’m sure it will be a relief to get back on to pavement. 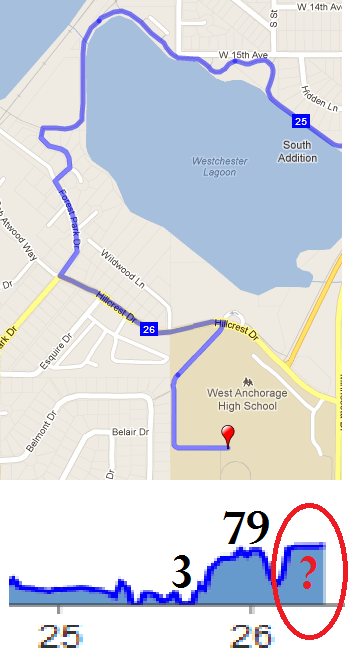 Around Mile 18, we start running through the actual city of Anchorage. Hopefully this also means more spectator support! 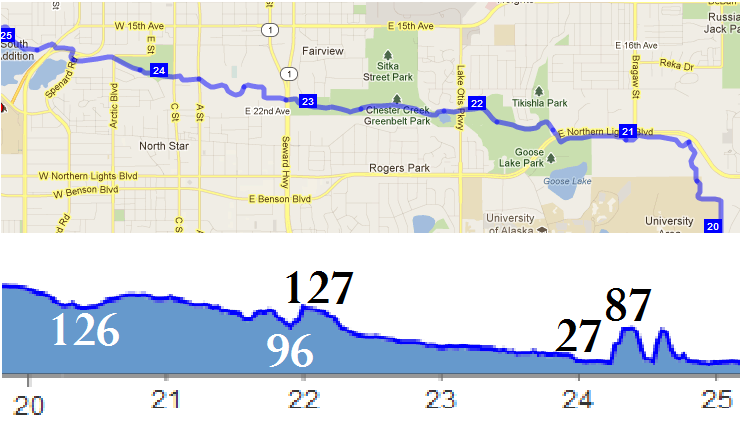 Miles 21-25 are mostly downhill, but still involve a few pesky (and downright ornery) hills. If I’m still feeling good, I’ll run at whatever pace feels comfortably fast. But if I need to walk, I’ll walk. It’ll be the longest run of my life at this point! I found a really cool running calculator today while surfing Runner’s World boards about increases in running performance going from altitude to sea level. 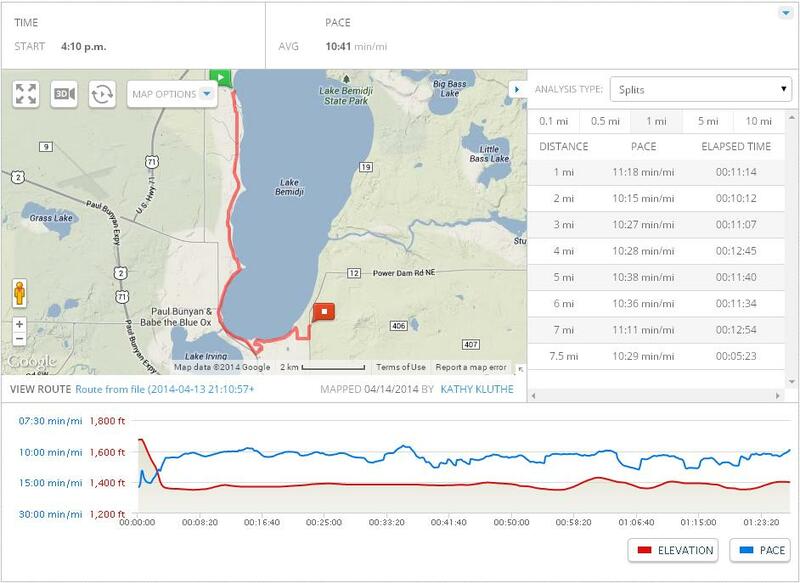 Using the pace from my 20 mile run (which would mean a 5:07 marathon), it calculates that at sea level, I could run the marathon in 4:48, an average pace of 10:58 (an increase of about 30 seconds per mile). I would be beyond thrilled with that time. But again, I want to enjoy this race more than I want a certain time so even though I’ve been tempted to print off a pace band for a 5-hour finish, I won’t. I don’t need the clock staring me down – I’ll have plenty of hills doing that! But I’ve very glad to be feeling excitement! I’m looking forward to getting out there and proving to myself that I can do this. It still seems incredible to me that I am ready to run a marathon. That’s crazy talk! And in just 9 days, I’ll be at the start line.